Most people recognize that a good dental hygiene routine at home is the cornerstone of an effective dental care routine. However, not everyone adheres to those principles every day. Either out of neglect or simply not noticing, some patients fail to do all they can to keep their smiles healthy at home. Fortunately, good hygiene education is one of the many expert services we offer all patients at our Encinitas/San Diego periodontal office. No matter how long you’ve been practicing good hygiene, it’s always helpful to freshen up your knowledge. For example, it’s important to know exactly what dangers your smile faces in order to effectively protect against them. The most common threat is the excessive buildup of plaque on your teeth and gums, which is made up almost entirely of oral bacteria. It doesn’t take long for plaque to calcify (harden) into tartar, which you can’t remove on your own, and the bacteria can gradually lead to issues such as tooth decay, gum disease, and more. Because plaque is the most frequent threat to your smile, controlling it is one of the most important facets of good hygiene. That requires brushing your teeth and gum line at least twice a day and flossing at least once, as well as refraining from excess sugar consumption. 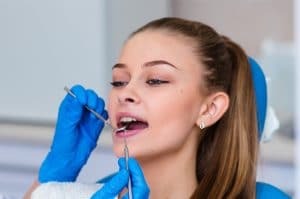 In addition, you must attend a preventive checkup and cleaning appointment at least once every six months to have all traces of plaque and tartar thoroughly removed. Sticking to a routine schedule of brushing and flossing is vital to maintaining an effective hygiene routine. By doing so, you can severely limit the amount of bacteria that cling to your teeth each day, which reduces your risks of developing plaque and tartar-induced concerns. By visiting your dentist or periodontist on a routine basis, you can also get a significant heads up if an issue does occur, allowing you to address it as soon as possible. With a consistently good hygiene routine backing your smile up, you can prevent or confidently face any issue that it might face. For more information, schedule a consultation with Dr. Kania by calling her periodontal office in Encinitas/San Diego, CA, at (760) 642-0711.